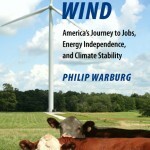 Here is the rest of our interview with Philip Warburg about his book, HARVEST THE WIND. He talks about the raging controversies over wind power’s environmental record, showing that reports of bird deaths are wildly overblown, far less than the toll of climate change and the common house cat, and going down sharply because of new turbine technology. He also tackles the challenge from China, and tells us what public policy is needed to keep our wind power industry vital and growing.